With its accession to the 1958 and 1998 Agreements, Japan gained voting rights regarding adoption and revision of regulations at WP29. As a result, Japan was able to have its voice better heard and gain greater influence at the forum's meetings. In order to assist the Japanese government's position as it took on heightened importance in this field, JASIC's experts take part in every meeting as regular members. Moreover, JASIC conducts test research to technically validate the reproducibility of test methods or the feasibility of new standards that are discussed at these meetings. JASIC sets its aims for the countries/economies in Asia to participate in the activities of WP29, to accede to the 1958 Agreement, and to adopt the ECE Regulations under the 1958 Agreement. With these aims, JASIC organizes government-industry meetings and is engaged in Asia-Pacific Economic Cooperation (APEC) activities. Following Japan's accession to the 1958 Agreement, ECE Regulations have been progressively adopted in Japan, clearly demonstrating the government's intent to pursue the mutual recognition of such regulations. 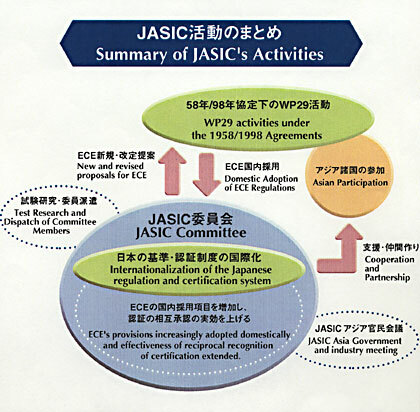 JASIC is involved in the support activities for planning the adoption of ECE Regulations into Japanese regulations and revising the Japanese regulations accordingly. In addition, JASIC assists the government in incorporating the latest revisions of ECE Regulations into the applicable Japanese regulations in a smooth and efficient manner. By attending meetings of such organizations as CITA, the International Motor Vehicle Inspection Committee, JASIC gathers data for research on various countries' inspection and servicing systems. JASIC is playing an important role in the gathering and translation of information relevant to the global harmonization of vehicle regulations and the introduction of system for mutual recognition of vehicle certification. *JASIC makes available the latest information on its activities through this website and other means. *To see our publications, go to the Publications page. Click here to view the pamphlet.